Posted on March 5, 2012 by Brandrenaline, Inc. This case study, if it had a title, could be called “Credit where credit is due” – or maybe we would call it – “Yeah…. I did that deal”. That title would come from the ‘discussions’ held after the fact about how this partnership came together. Who ‘really’ made it happen? I am still not sure – but I’ll tell you what I saw…. from where I was standing. Would it have happened without Arie Luyendyk – Indy 500 Champion – as the professional athlete and corporate spokesman? Would it have happened without Fred Treadway as the team owner? Would it have happened without Grant Haughawout as the show-car truck driver? Would it have happened without the ‘Milkman’? What would have happened without Square One – the decal/vinyl graphics shop? We may never know…. they were all ‘involved’….. and oh yeah…. so was I. 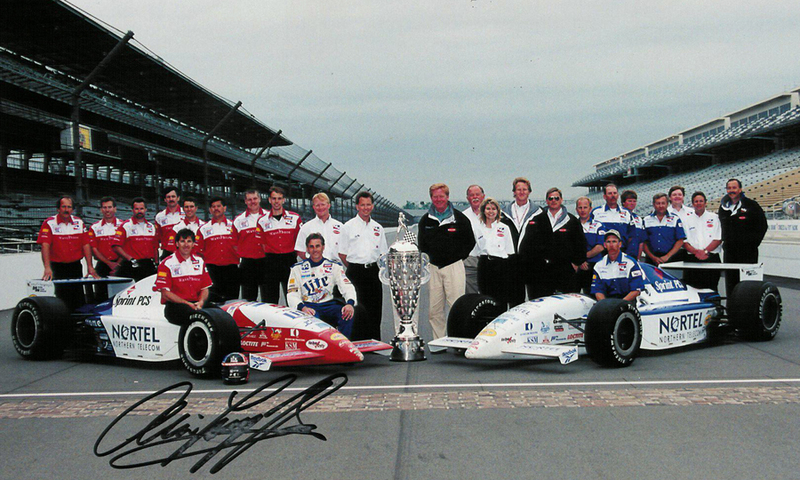 In March of 1997, while overseeing all marketing, communications and sponsorships for Treadway Racing – a 2-car team competing in the Indy Racing League – I contacted both the Indianapolis Motor Speedway (IMS) and the folks from IEG (the sponsorship guru’s in Chicago). I proposed that we host a motorsports marketing seminar at the Indianapolis Motor Speedway sometime during the awesome ‘Month of May’ activities. We would invite up to 1,000 executives… decision-makers from companies not involved in the use of motorsports as a marketing tool. We had two strong credible industry forces to capture this audience – the Speedway, site of the world’s largest single day sporting event, and IEG – the global leader in sponsorship. So I crafted a letter, to be sent on IMS letterhead and under Tony George’s signature, that was sent to IEG’s targeted list of marketing pros. It invited these execs to a full day at the track on the Friday preceding the qualifications for pole position, which would happen on Saturday. We knew that to invite them to come on a Saturday would lessen the attendance significantly – despite the draw. Who would be willing give up a weekend, even for this? They would have breakfast with Tony George and 4-time Indy 500 winner – A.J. Foyt. They would then get a tour of the museum, including the basement where the good stuff is kept. Then off to Gasoline Alley, the team garages and pit lane – all of which require ‘special’ credentials. A tour of the corporate hospitality facilities, specifically the luxury suites overlooking pit lane, would be where they would end up. What wasn’t in the letter was that when we got them to the suites, they would get a soft ‘pitch’ on team and league level opportunities. This letter was sent to approximately 1,000 executives. Who showed up? Stay tuned….. Sometime in mid-April, Grant, who then hauled around one of our showcars, was unloading a car at the Castleton Mall in Indianapolis. Why it was going on display escapes me, but here is Grant unloading the car when a young guy walks up and is intrigued by the car (that’s the whole idea – by the way). He quizzes Grant… how fast? how much? why no tread on the tires? how much power? – the usual. The guy gets around to asking Grant why it’s there and Grant explains the ‘marketing power’ of one of our showcars. The guy then tells Grant that his company – Sprint PCS – is about to launch in the Indianapolis market and quickly figures out that he could use this car to help kick off the program. He hands Grant a card and is told that one of the marketing peeps from Treadway Racing will give him a call. The next day, Grant hands me the card at the race shop and tells me that this guy wants to ‘rent’ a showcar. I immediately take the biz card and hand it to the “Milkman’. David, (Milkman) who was responsible for Business Development (finding new team level sponsors) calls the guy from Sprint PCS and they agree to meet and chat. Within just a very few days, a showcar request escalated to having our driver – 1990 Indy 500 Champion Arie Luyendyk – launch Sprint PCS – at a media event held at the Speedway, in the Treadway Racing suite. 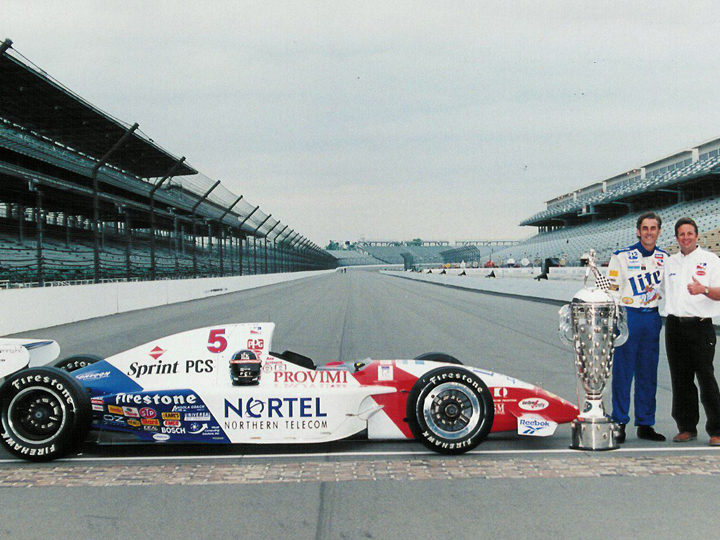 Arie would make the first call on the new Qualcomm manufactured Sprint PCS phone during the first week of practice for the 1997 Indy 500. To call the timing lucky would be an understatement. At this point, the ‘negotiations’ were with local market reps from Sprint PCS – out of Cincinnati I think. By early May, the rsvps were returned from those executives who would take advantage of the ‘opportunity of a lifetime’ to come to the Speedway and get the behind-the-scenes look at this sports and event marketing powerhouse. Out of 1,000 invites, 11 people were coming, representing four companies. Wow… this is tough. But of the four companies attending – two of them that signed up did business together – Sprint PCS and Nortel. The executive from Sprint PCS was none other than Charles Levine – the newly appointed CMO for Sprint PCS. Back to the local market event. Between business media and the racing media, the product launch/media event that was held at the Treadway suite at the Speedway went well enough with Arie that Sprint PCS asked for Arie and the showcar to be present at the first retail store opening which was happening in just a few days. 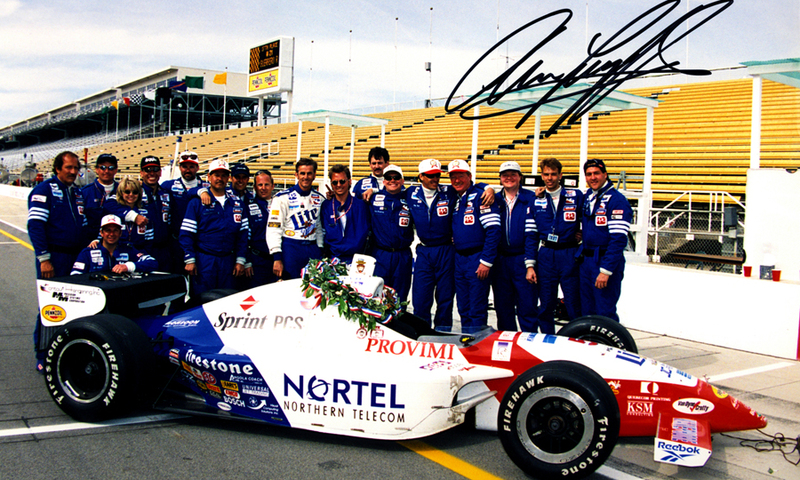 We all agreed on rights fees, expenses and all that stuff real quick and within 48 hours, the Sprint PCS newspaper advertising was featuring Arie Luyendyk and inviting customers to meet and greet Arie – get autographs, photos and racing memorabilia. Now, it is important at this time to mention that a few key people were not involved in any way at this time – team owner Fred Treadway and Sprint PCS CMO Charles Levine. The store opening went well and Sprint PCS was seeing measurable results from the program at this level. Sprint marketing types from Cincinnati and Minneapolis were catching the drift of all this. At this point, there was great desire on my part, and on Milkman’s part to grow this program – Sprint is one of those powerhouse companies that bizdev folks get real excited about. We also knew the power of local market buy-in, as well as the power of buy-in from key ‘influentials’ below the person who ‘signs the checks’. Friday May 9 came quickly but we were ready. Working in concert with speedway marketing types, we had a full day planned for our 11 attendees – all of which showed up. We went about our business of racing on that day. We had plenty to do – over 100 guests from our other sponsors were present. The suite was full of guests all day long. We were doing last minute contingency sponsorships including an agreement with Tom Floyd from Pennzoil. I mention this because as it turned out, this became a very lucrative partnership for us. Somewhere after lunch, I reached out to one of the Speedway marketing people that was on the tour to inquire as to what the mood was like – I wanted to know how they were responding. I was told that one of the attendees really ‘got it’. He was talking about Charles Levine from Sprint PCS. I didn’t actually meet Charles until around 2:30 that afternoon. We had a brief introduction and I asked him if he was enjoying himself. He was ‘cool’… “I know what this all about”… was his attitude. I then asked what he thought about our local market efforts and he thanked me for what we had done. When I started to get into a little of the detail of those efforts, he cut me off explaining that he didn’t get too involved “at that level”. We sit with Charles and get right to the point. We can get Sprint PCS on Arie’s car tonight and with Arie being the favorite for the pole tomorrow – Sprint PCS will be seen all over the country for a fraction of what their existing ad plan can do – and we had already proven the demographic similarities through our local events. Charles seems interested but he leaves the motorhome within 3 minutes explaining he doesn’t want to miss the tour and that he will think about it. I am feeling that we have a 50-50 shot at getting some sort of partnership. After 14 years (at that time) of trying to put these programs together, that was very optimistic for me. Milkman and I quickly figure out that if Charles were to say yes to some sort of program at 6 pm tonight, our decal vendor will most likely be long gone. So we take a big chance – Milkman and I get with Steve Turner, (our decal guru, purchasing manager, tire guy, mechanic, all round good guy) we call Square One Graphics and prepare them for a possible order for Sprint PCS decals. Now at this point, we don’t know what might happen, but we need to prepare for just about every conceivable level of partnership. We quickly put together a list of various sizes and colors. That list by the time we were done was over 200 decals. Square One doesn’t have artwork for this new logo so I suggest that they get a newspaper from last week and pull the logo from an ad and begin scanning it so that it will work on his computers. These vinyl graphics shops that are based in Indy, there are 3 or 4 of them, live and die by their ability to service this type of last minute request – it happens all the time. To further complicate our situation, Square One was working flat out on another team’s ‘last minute request’. We were told, in no uncertain terms, that if we needed these decals, we needed to confirm the order by 6pm and that Square One would have them ready by 4:00 am – yes 4:00 in the morning – Saturday morning. Cool….. plenty of time. I whipped out the Kraco proposal again and showed him that what I was offering him was, relative to the Kraco proposal, a good offer. I also showed him the exposure that Arie had received from Pole Day qualifying in 1996. Well…. 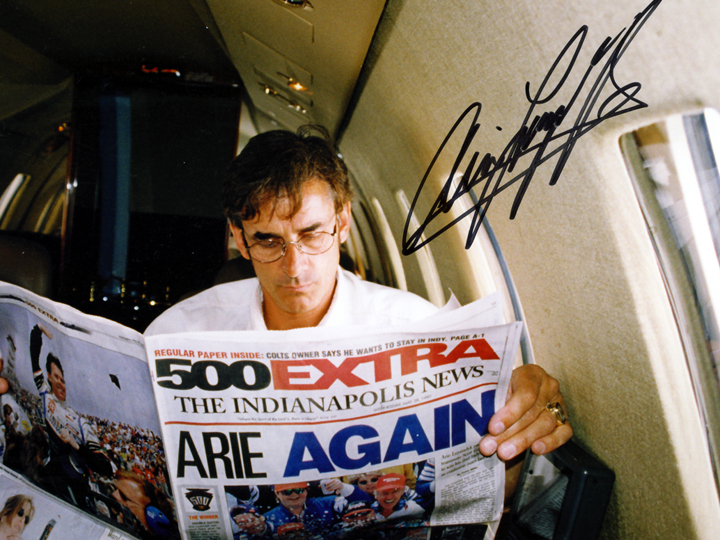 Charles said yes – to a 1 race deal – the 1997 Indianapolis 500, starting with Pole Day (tomorrow) for $250,000…. But then he immediately said that he had to let his marketing people in Kansas City know about it…and get their blessing – he wanted them to be supportive of this – and rightly so. He also said that he wanted to figure out a way that he wouldn’t have to pay for it. I wasn’t sure exactly what that meant but explained that we had to get started. So, we separated again – Charles called head office and Milkman and I called Square One to give them the green light. We agreed to meet at the Speedway, at the entrance to Gasoline Alley (which will be locked) at 4:00am. Charles rejoined the tour – and remember that execs from Nortel were on the tour? Well Nortel is a major vendor to Sprint – they sell them telephone switches – big ones – multi-million dollar ones. So Charles got Nortel involved ‘somehow’. We believe that there were co-op marketing dollars involved but we never did find out. It was good enough for Charles – so it was good enough for us. 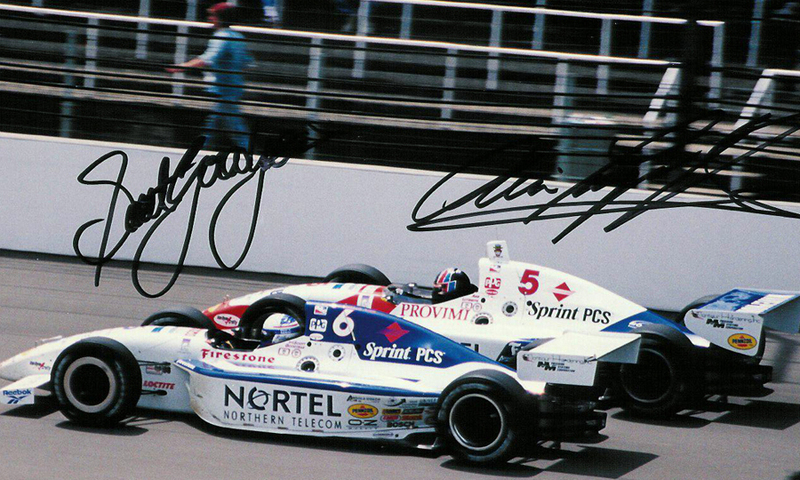 Scott Goodyear, who was Arie’s teammate was also supported by Nortel, although a different group – but a nice fit nonetheless. We had done this deal on a handshake – we didn’t have any choice – and I thought that we were we done…. for now. We weren’t. Charles asked to meet us one more time and ‘suggested’ that because their market launches in Texas and Nevada happened at the same time as our races there – “I would like you to just leave the decals on for those 2 races as well”. This was not part of our deal – we could have asked for more money – but were pretty sure that would have been risky. But we needed something – so we asked that for Sprint PCS phones for everyone on the team – and – that Charles agree to a meeting in Kansas City to discuss a multi-year plan that includes vendors, retail distribution, corporate hospitality, use of marks, inclusion in Sprint PCS advertising, and anything else that we could include to help with the launch of their new brand. Charles agreed – we agreed – we all went back to work. I ran into Fred Treadway on pit lane around 6pm – told him what he had done, to which he replied “Cool”. So, we met the decal guys at 4am (jumped the locked fences to get into the garage area – a big no-no)…. and by the time the gates opened at 6am, we had Sprint PCS logos on everything. Arie went on the capture the pole, and then went on to win the race. Charles had done very well – Sprint PCS received over $3.5 million worth of in-focus TV exposure for this event (source – Joyce Julius) – and we were thrilled with the future possibilities with this global brand. By mid-September a multi-year multi-million dollar partnership was done that included Qualcomm and Radio Shack. So… who did this deal? Well, as you can see it was a team effort. Lots of people can take credit for this one – and rightly so. The photos below – courtesy of the Indianapolis Motor Speedway – highlight the fruits of all of our labour. Enjoy! NASCAR 2012…. by the numbers! Canadian Superbike – My Take! NASCAR’s Declining Audience – What would Steve Jobs do?